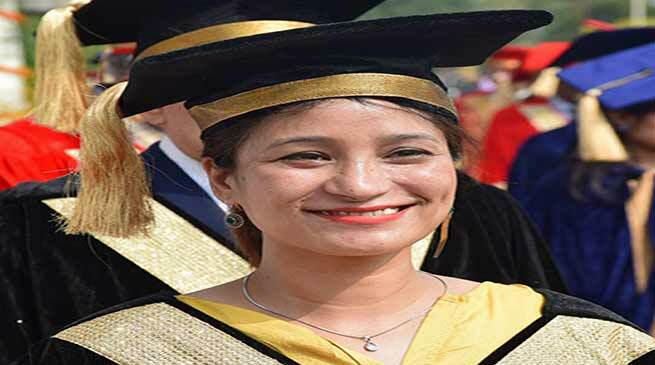 The mountaineer Anshu Jamsenpa was conferred Philosophy of Doctor (Ph.D.) degree by Arunachal University of Studies during its 2nd convocation held at Namsai recently. Hon’ble Chancellor Kamal Lochan handed over the highest academic degree of the university to her in the presence of Deputy Chief Minister Chowna Mein, Planning & Finance Parliamentary Secretary Chow Zingnu Namchoom, World Education Mission President Dr. Ashwani Lochan, Pro Chancellor Prof. K.G. Goel, Vice Chancellor Sh. V.K.Kawatra and other dignitaries. Attending the convocation as special guest Kunwar Shekhar Vijendra Chancellor Shobhit University said that the doctoral degree in Adventure Sports & Tourism entitles Anshu Jamsenpa to teach as faculty or professor in any college or university around the globe. AUS Pro Chancellor Sh. Vishva Lochan while congratulating the world record holder mountaineer Anshu, stated that she is the true symbol of empowered women and the pride of India. IMF Vice President Akhil Bakshi FRGS, former OSD to PM also congratulated Anshu on becoming a Doctor of Literature in the field of Adventure Sports & Tourism which he said is rare achievement. Being a world renowned adventurer himself, he extended an invitation to Anshu to visit New Delhi to work on developmental project to promote mountaineering & allied adventure sports at pan India level. During her brief speech Anshu extended gratitude to the Board of Governors, AUS Academic Council and the Government of Arunachal Pradesh. She also thanked the family members, friends, well wishers and the media friends for their wholesome love and support during her trying times. She ended by stating “While climbing mountains I always think of summiting the peak whatever be the circumstances. In the same way I want you all, especially the young students to keep working towards your goal and never give up. Always think positive, stay positive and believe in positive action because Universe responds to what we believe”. During the convocation, the Honoris Causa Doctor of Literature Degree was also conferred to educationist & social reformer Mr. Thanapat Choomposil from Thailand and the dynamic political face of North East India in Union Government MoS Home Sh. Kiren Rijiju, in absentia.